These days, one of the most important tasks you perform on your computer is making sure your personal information and data is as secure as possible. You don’t have to go far around the web to hear horror stories of users not taking the necessary precautions and living to regret it. Whether it’s financial, personal or just important to you, keeping your electronic data safe is essential these days. Being secure is not just about protecting your files either. Keeping important files protected while on your PC is just one area which needs to be addressed. But backing up your precious files is something else that is often overlooked by some people because of the “it won’t happen to me” attitude some of them unfortunately have. Also, not to be forgotten about is making sure certain data that has actually been deleted is not recoverable. As many of you know, when a file is emptied from the recycle bin there is still a window of opportunity for it to be undeleted using something like Recuva or Wise Data Recovery. Here on Raymond’s we cover a lot of utilities in these areas because of their importance in keeping users safe from the pitfalls of storing personal or important data digitally. Usually though, when you mention file backup, file encryption and secure file erasing, you would be looking at two or three different utilities to get the job done. 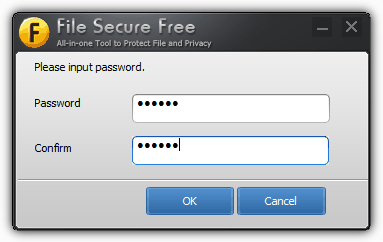 File Secure Free is a piece of software that aims to be an all in one security tool to let you perform all those tasks from the relative comfort of one simple to use interface. It actually boasts four different primary functions; simple file and folder backup to keep a secure copy of important data, encrypt or decrypt selected local files, secure file shredding, and also a function to lock your USB stick or external storage device with a password. 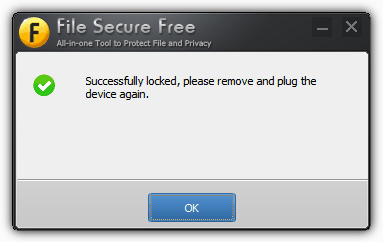 File Secure Free is only a couple of Megs download and installs without pushing any adware on you. Portable application fans needn’t feel left out here because you can simply extract the installer with 7Zip and then delete the $COMMONFILES and $PLUGINSDIR folders to turn it into a portable program. The program certainly can’t be accused of being difficult to use or confusing, everything is there in a straight forward and simple to understand interface. 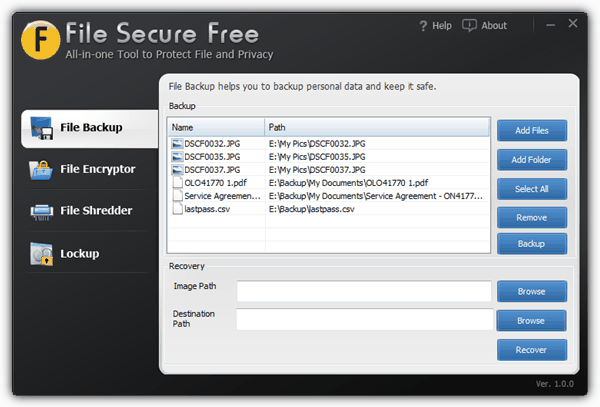 The first option is the file backup option, and while it’s not designed to be some sort of Acronis TrueImage alternative, it can backup files and folders and encrypt them with a password. Select what you want to backup using the Add Files/Folders buttons, highlight what to backup and then click Backup. The output will be a .dfi file and will be encrypted using the Advanced Encryption Standard (AES) algorithm. A dialog box will ask for a password to use for the encryption, a minimum of six characters will be required. Recovery is easy enough, Browse for the dfi file and Browse for the destination folder to put the files. Then click Recover. File Encryption works in a not too dissimilar way to backup. Select the file to encrypt (any type of file is accepted) or selecting the folder option will process all the files in the folder, not the folder itself. You will instantly be asked to choose a password and the items will show in the program window as ‘Encrypted‘. Each file will have the extension of .dfc and has to be decrypted again with File Secure Free. You probably don’t need me to tell you that as with file encryption, file shredding needs to be used with care. It’s pretty obvious that erase the wrong file and you won’t get it back again. The algorithms listed in the dropdown box are a bit vague in the number of passes they use. 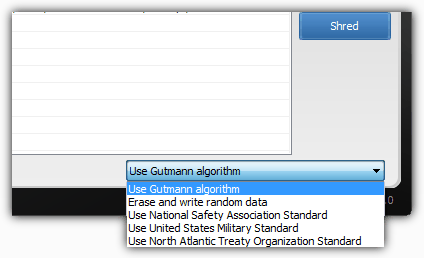 For instance, the ‘Gutman algorithm’ I believe will likely be the full 35 pass erase and Erase and write random data could be a single pass, enough for most mechanical HDD’s. The other three methods I suspect will be somewhere between 3 and 7 passes. Simply select your files or folder the same way as Backup and Encrypt. The last option is to lock an external USB stick, memory card or hard drive. Insert the drive, select it from the dropdown and click the Lock button. After entering the password the drive will need to be removed and reinserted. It will then show as ‘Unformatted’ or ‘Unreadable’ by the computer and will remain that way until you unlock it again. Although not loaded with options, File Secure Free is definitely a useful toolbox for performing four security related tasks from a single utility and can backup, erase and encrypt files with ease. I encrypted my important files, but i couldn’t remember my password, is there a way to recover my files?